It was the beginning of one era, the end of another. Alan Freed's Camel Rock 'N' Roll Party was for some of its listeners an introduction to the quickly emerging genre of rock 'n' roll. That was the new. The old was represented by the Count Basie Band, who appear on this and many other recordings of this show, which aired on CBS from March to September 1956 and was rebroadcast on the Armed Forces Radio & Television Service. Count Basie and his crew sound pretty hip here, though they were more identified with the music of the parents of the screaming teenagers heard throughout this recording than the kids themselves. Thus, this aircheck serves a symbolic end to the Big Band era and a glimpse into the sound that would soon completely sweep the nation, rock 'n' roll. 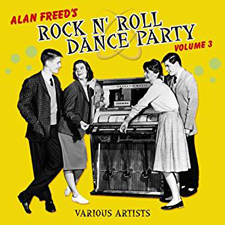 Enjoy Alan Freed with the Camel Rock 'N' Roll Party (UNSCOPED) here. Enjoy Alan Freed with the Camel Rock 'N' Roll Party (SCOPED) here.